We'd seen a pre-season game back in Baltimore, but it was on my TODO to see a real-deal NFL game. A friend of Em's visiting from Australia wanted to see a game, which was a good enough excuse to tick this one off. We got decent tickets $160 each(! ), which when combined with a babysitter for 7 hours (another $140), Uber and VTA fares, and food/drink at the game, it all made for a pretty damn expensive day. Amazingly it rained and was pretty cold. Amazing because it was probably only about the third wet day this year...but we came prepared and were comfortable under a blanket and raincoats. Getting to the game was fairly painless on VTA, and surprisingly efficient and fast on the return journey too. I just wished we had driven to one of the closer stops (like Moffett Park) and parked (we got an Uber to Mountain View and had to sit through lots of stops). Security was intense. If you expect to carry anything you should probably buy one of the NFL-approved clear bags. Anything else won't get in. 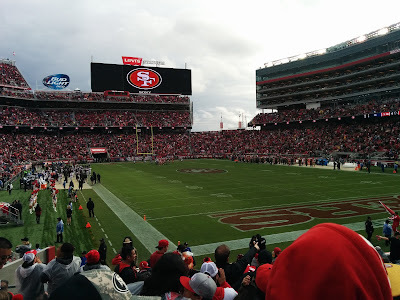 The game was great, and close enough to be exciting. The stadium is impressive (it will host the Superbowl this year), as is the constant bombardment of advertising. You probably don't go more than 20 seconds without seeing an ad. 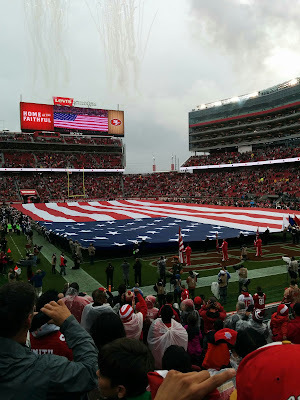 That wasn't surprising, the NFL is a money-making juggernaut, but what was surprising was the level of military propaganda: there were probably a dozen or more different "support our troops" moments from appearances by veterans on the field and in the stands, to multiple messages of support from players pre-recorded and played on the big screen. Unsurprisingly, there has been some significant recent controversy about paid patriotism in the NFL. It was a fun day, but I won't be rushing out to go to another game any time soon.